Commanding, Powerful, Affectionate and BIG! The Great Dane is a widespread working breed. Known for its impressive height, this dog often clocks in at heights between 30-34 in. (76-86 cm). This commanding breed was bred to hunt bears, boars, and deer among the royal courts in which they were popular. Danes are known to be very gentle despite their intimidating appearance. They make great family dogs and are very affectionate with people of all ages. Their overall positive and caring attitude makes them an enjoyable dog to own and adds an air of nobility to the household. Great Danes are bent on pleasing their owners. This personality trait makes them easy to train and ideal for beginner owners who want a large dog. Always demanding attention, they love to follow their owners around, forgetting their massive size and attempting to be lap dogs. 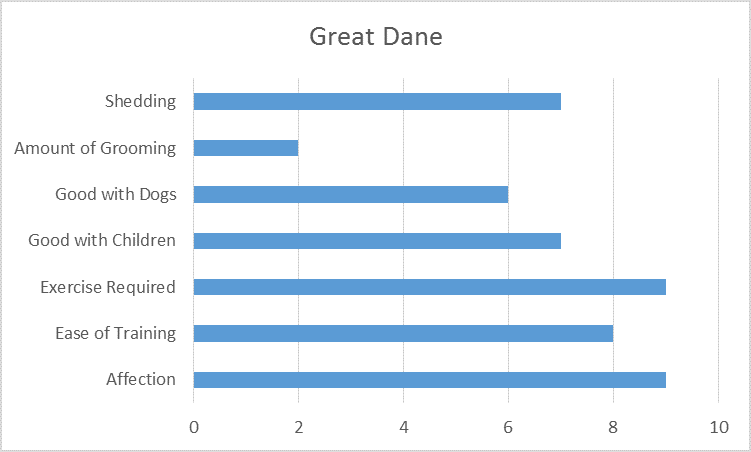 The Great Dane is famously good with people of all ages as well as strangers. They treat them openly and kindly. However, should somebody seem to be a threat to their owner, they will become very defensive. Early exposure to many people and other dogs can help them distinguish friend and foe. Dogs as large as this need a decent amount of living space for them to be as happy as possible. They are not ideal dogs for apartment life or small houses. They require a decent sized yard with enough room for them to stretch their legs and run around every once in awhile. It’s suggested to have a fence, but they are not known for frequent escape attempts by jumping fences. They are happy and energetic dogs. They can become a bit too enthusiastic and rowdy, if not given enough space to work out that energy in a calm way. Letting them play outside or taking them on a walk can help reduce this abundant energy. It's important to maintain their vigor, as it may become destructive if it is not released through other more appropriate activities. While this breed is not known to jump, it is still important to instill a no jumping rule. They're so tall you're basically already seeing eye to eye with them. A Dane with a jumping problem poses a safety hazard because it's massive size can easily injure whoever it jumps on. It’s just as important to teach them to not get too excited and topple strangers as well. This gargantuan dog breed is also known to have a colossal voice. Their bark can be heard from a decent distance away. Their loud bark can be a bit of a nuisance at times, so If you or a neighbor are sensitive to volumes, getting one of these dogs may not be the best idea. They have huge tails that are always wagging with excitement. These tails can be a bit dangerous, knocking down any low-lying objects, including children. It’s a good idea to keep everything above tail level while owning this dog. They can also get too excited and run too fast, knocking over anything it can in the process. The Dane has been around for a long time, and it is suggested that the earliest existence of them was around 2,000-1,000 B.C. Dogs similar to them seem to be described in Chinese literature and in Babylonian temples. It is even possible that their existence extends back to the time of the Ancient Egyptians. It seems that Assyrians traded this hound with Greek and Roman people. These Mediterranean inhabitants then proceeded to breed the Great Dane with other dogs, which in turn created several dog breeds seen today. Dogs like the English Mastiff and Irish Wolfhound are thought to be descendants of this breed. This gigantic hound grew in popularity because of its physical prowess and skill when it came to hunting. The versatile breed was especially famous in Germany, where it was often used to hunt boars. It is also thought that they were used as war dogs by the Romans as well. As well as being used for hunting, they were a sign of wealth in Germany in the 1600s. Great Danes were often chamber dogs for the Royals, decorated with precious materials. They admired the physical prowess of the dog, which was an admiration that was soon shared with many people throughout Germany, especially in the 1680s. Today, they have either down hanging or cropped ears. Cropping the ears was a common practice when they were used as boar hounds. Given the violent nature of the hog and its sharp tusks, these dogs often found their ears torn up after encounters with these beasts. By cropping the ears, they were harder to be damaged. 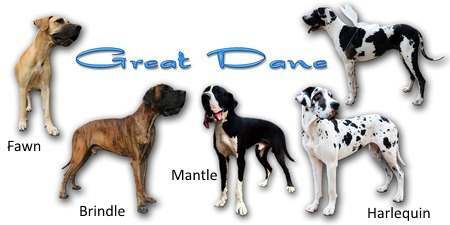 It was in the 1800s that the Great Dane was making its first appearances in the United States. Their popularity as a hunting dog and pet grew exponentially in the US, despite the difficulty of having such a large dog. In modern days, this breed is the 15th most popular dog in the US. Despite its name, the breed is not Danish. It was, in fact, a German breed, and its unusual name sparked controversy amongst dog breeders. In 1880, German peoples suggested that the breed’s name be switched to the Deutsche Dogge, because of its true heritage. Clearly this renaming attempt failed, as breeders in Europe found nothing wrong with the current name, yet it is still popularly referred to in Germany as the Deutsche Dogge. 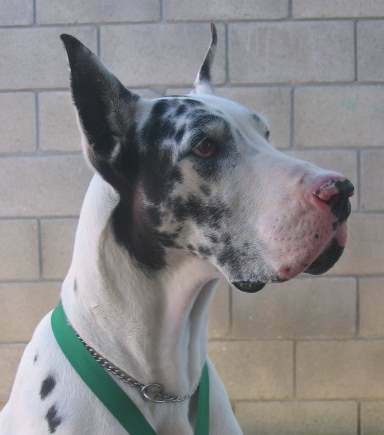 The Great Dane was first officially recognized by the AKC (American Kennel Club) in 1887. There are 6 show coat colors for the breed, according to the AKC. These colors are black, blue, brindle, fawn, harlequin, and mantle. They also come in combinations and Merle, but these are not allowed in the Show Ring. They is one of the easiest dogs to train. Their desire to please their owners makes them eager to learn. While most people take their dogs to obedience classes, a Great Dane could be trained without them. However, early socialization in these classes is helpful for the dog to be familiar with other canines. This dog is well known as a somewhat sensitive dog. They respond best to positive reinforcement while training. Stern, disciplinarian owners, are ideal so that they command the attention of the dog, but harsh criticism will get through to the dog and only make them more reluctant to learn. Another characteristic of the breed is their booming bark. Despite the intimidating bark, they are not very aggressive whatsoever. Their loud speech can be annoying to the owner and their neighbors, so it's best to train them to stop barking on command. 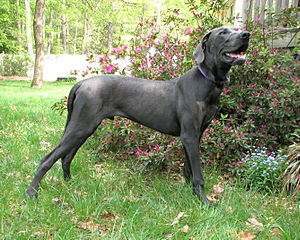 For the most part, the Great Dane is a low maintenance dog and does not require much grooming. They only need to be bathed about once a month, granted, this depends on how dirty they decide to get. Their short hair coat does not tend to pick up a lot of dirt and grime, though, so it is not a very smelly dog. It’s not just their coat that needs brushing. It's also important to maintain good dental hygiene as well. Buying the right type of food is important, as they are known to have dental issues. Brushing their teeth 2-3 times a week can help keep its breath smelling nicer as well as keeping its mouth clean and healthy. Clipping nails is also a necessary task when it comes to grooming. Nails should be clipped before they're too long, as excess length can be painful for the dog. It's important to be gentle and careful while clipping their nails. If it is hurt while getting its nails clipped it'll be reluctant to do it again, and they can be stubborn when they don't want to do something. Great Danes need to be brushed a couple times a week. Regular brushing helps remove excess shed hair and dirt trapped in it. Owners of Great Danes have to clean their houses as well as their dogs, as Great Danes will shed hair. Cleaning ears is a necessity as well. Their ears hang naturally, which makes them prone to infection. Regular ear cleaning will prevent infection and keep the dog happy. Some owners have the ears cropped, which makes ear maintenance easier. Ear cropping, however, has become controversial and the practice has been banned in many countries, particularly in Europe. 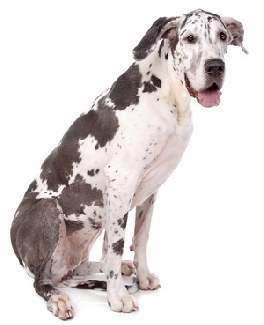 As with all dog breeds, Great Danes are prone to some health issues and genetic diseases. It's important to provide them with the sufficient health care it needs. 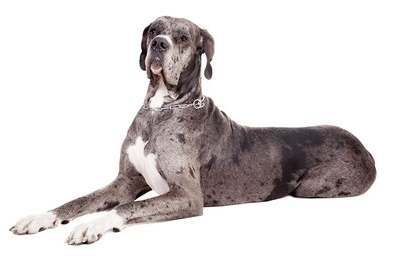 Giant dog breeds tend to have a short life span, so owners must provide excellent nutrition and health care to keep their Danes living to their fullest. While not all members of this breed are immediately condemned to any of these health issues, it is important to become familiar with them just in case. Finding a trustworthy breeder can help in buying a healthier Great Dane with less chance of genetic disease. Before making a decision on a breed or adopting a new puppy, we always recommend that you do as much research as you can before the big day. We have tried to provide you with an unbiased look at this breed to help you make that all important decision. However, we also want you to be a well informed consumer. The following books are highly recommended - click on the image to find out more.